Although it was previously thought that tipping of a single-rooted tooth (Fig. 1) occurred about a point almost midway along the root, rotation now appears to take place near the apical third within an elliptically shaped area. Half of the periodontal ligament is stressed, with maximum pressure created at the alveolar crest in the direction of movement and at the diagonally opposite apical area. 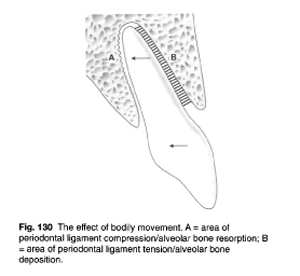 For bodily movement and rotation,a force couple must be applied, loading uniformly the whole of the periodontal ligament in the direction of translation so both crown and root move in the same direction by equal amounts (Fig. 2). With extrusion, all of the periodontal ligament is tensed, but when a tooth is intruded the force is concentrated at the apex. An element of tipping is unavoidable with extrusion, intrusion and rotation. effect the movement desired but it must also be sustained for sufficient time. For successful movement, a force must be applied for at least 6 out of 24 hours, and continuous application of light forces is optimal. This is favoured, because control of tooth movement and anchorage is facilitated while the risks of pulpal and radicular damage are minimised. Excessive mobility is avoided and movement is more efficient with less discomfort. Movement of the order of 1 mm in a 4-week period is regarded as optimal, with faster progress recorded in children than in adults. This is largely a con-sequence of the greater cellularity of the periodontal ligament, more cancellous alveolar bone and faster tissue turnover in a growing patient, which ensure a more rapid response to an applied force.